This blog deals with our outdoor heritage. It concentrates in particular on the history of fishing and fishing tackle, and seeks to provide interesting, informative, and important materials for anyone who wants to help preserve our nation's (and the world's) fishing. ©2007-2018 Dr. Todd Larson. When I first started thinking about researching fishing tackle history while I was in graduate school, there were a few people I admired and hoped to emulate. They included Steve Vernon, Mary Kefover Kelly, and Michael Sinclair. 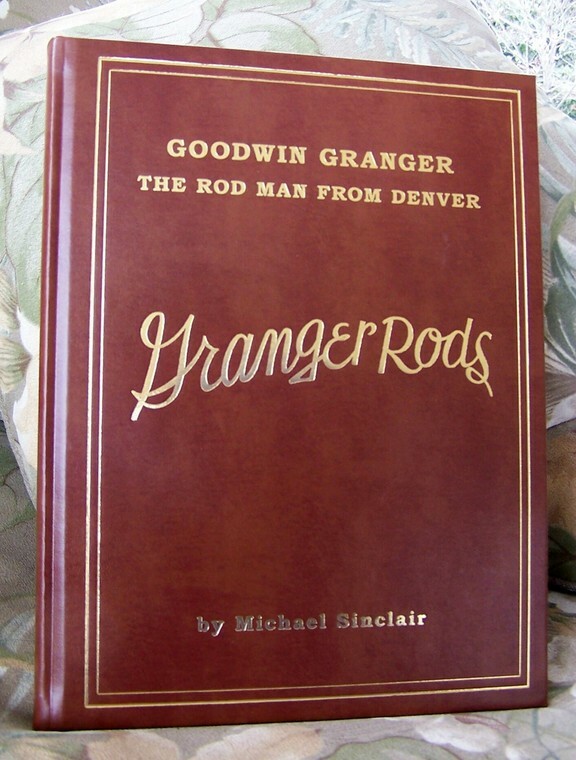 The author of a number of important books and articles on rod history, including a biography of Fred Divine and a history of Heddon rods, Sinclair has recently turned his attention to his original passion, Granger fly rods. His new book (look for a review here tomorrow) launched about three months ago, and we were able to corner him for a couple of hours to answer some questions about collecting fly rods, the Sinclair triumvirate of Divine-Heddon-Granger, and the difficulty in researching vintage rodmakers. TODD E.A. LARSON (TEAL): Let me be the first to congratulate you on this incredible book. I don’t think most people realize how difficult it was to not only write, but to self-publish. How did you find the experience of putting together the Granger book? MICHAEL SINCLAIR (MS): It’s something I enjoyed doing. It was a book that was done over a long course of time. I spent about a year just assembling everything and putting it into some kind of logical form. It was something I enjoyed doing, and it continually amazes me that even after all the research we keep picking up little bits of information we didn’t know existed. TEAL: Why have you been so attracted to rodmakers who sort of fly under the radar, so to speak? Divine, Heddon, and now Granger. Are there commonalities between them, or is your attraction to these kinds of rodmakers just happenstance? MS: It was a very conscious decision. Take Fred Divine. No one was even spelling the man’s name right when I started getting involved with him. While I won’t say it’s the ultimate sign of disrespect, no one seemed to care enough to get it right. And while I understand that for a while Divine rods fell out of a favor because they were making some cheap stuff, that was a matter of survival for the company. They had to do what they could to sell rods. Once they got on their feet and started making better rods, their reputation seemed pretty well shot. On the other hand, Granger and Heddon were a little bit ignored because they weren’t located in the fly fishing media centers. They were well known in their own areas but not in the East, where the larger population of fly fishermen lived. Interestingly, Divine was right there, in upstate New York, and there is no reason in the world he did not receive more attention, good or bad. But I think a lot of people missed out on some fine rods from Divine because in his day, and by today’s standards as well, they made some really fine rods. TEAL: Do you think the slights against Divine had anything to do with his untimely and early death [Fred Divine died in an accident in his shop in 1900]? MS: Definitely. Fred was an outgoing and affable person, and he was really their main salesman. He enjoyed traveling and going out and meeting the store owners, and getting people to represent his rods in far-flung places like Denver. I remember looking up where he stayed at the Brown Palace Hotel in Denver, and that was the first time I found his signature, which matched the ones I found on his patent drawings. He traveled a lot, especially to Chicago, Denver, Kansas City, St. Louis, and those were logical places because that’s where the major catalog houses were located. And of course, he went to Los Angeles, too. He had a really good relationship with a defunct company there called McLaughlin Sporting Goods. You see a lot of Divine rods marked McLaughlin. The William Hoegee Company carried Divine rods in their catalog for many years. Divine also had their own catalogs, and those are pretty cool, too. I’m still looking for certain Divine catalogs, especially ones that carry the two-piece rods like the Feather-Wate. I have only seen them in trade catalogs. The latest ad I have found for the Divine Company is 1936. It’s nothing special, it’s not one that shows models, but rather is a generic ad similar to the ones they ran in the 1920s. But it is surprising they advertised that late. TEAL: They couldn’t have had more than one or two people working for them by then. MS: I would think not. Probably just George McDuffee by then, maybe one other rodmaker had stuck around. It’s finding the little tidbits like the 1936 ad that I enjoy. In the beginning of the Divine book, I said writing a book like this is like creating a dot-to-dot puzzle. A single dot may not answer all the questions, but it will at least tell you which direction the line should go next. TEAL: I think at some point, you can spend another ten or twenty years researching and not significantly add to the story. Then you publish the book, and a flood of new information comes in! MS: That’s always my belief. With the advent of the internet, we have the most powerful research tool invented. So is eBay. eBay is just a tremendous source of information. Part of the fun is seeing what comes creeping out of the woodwork next. TEAL: Give me an example of using eBay for research. MS: A good example of this is the oldest Granger I own. No one had ever seen one, we had heard they existed, and suddenly one shows up on eBay. And I was lucky enough to get that rod. And now there is another one there, and it’s in better condition. I can’t wait for the last minute of that auction. It will be like the Wild Wild West out there. Information is power, and as people become more comfortable, they are willing to spend more money. TEAL: You mentioned you thought of Heddon and Granger in the same terms. Can you elaborate on this? MS: They were the same basic type of company when it came to rods. Of course, no one can compare to Heddon, because they made hundreds of thousands of rods, reels, and lures, and no other company I know of can claim that. I think that is something Heddon should be proud of, because not only did they make these things, they made them very well. Their slogan “Heddon Made is Well Made” was not just a slogan. I don’t mean perfectly made, but they were extremely well made. Their lures you couldn’t beat for beauty and construction. The reels were as fine as anything you could find, the 3-25 and 3-35 were outrageously nice Blue Grass quality reels. Then you get into their rods. The only complaint I have about Heddon rods are those black ferrules, they are garbage! I am not sure they aren’t made with aluminum. I’ve never fiddled with them [to find out]. Heddon and Granger both offered enough different tapers that you could always find one to suit your tastes. I think that Heddon and Granger were also similar because they were both Middle Class rods. Let me amend that. I’d say Heddon was a Middle Class rod, while Granger was an Upper Middle Class rod. I do believe that Heddon borrowed the ammonia technique from Granger, because Granger started making [fly] rods before Heddon did, and I think Heddon immediately saw the advantages. TEAL: So you think Grangers are better than Heddons? MS: I do believe Grangers are better rods. Their consistency is unparalleled. I don’t care who you’re talking about it, with the possible exception of Payne, I don’t think you’ll find anyone who was more consistent in their quality. That was no accident. You can look at the early ads from the 1920s and see Granger hammering away at quality standardization. I think that’s the key to Granger’s great success, in that you can pick up any Granger and it has the same action, whether it is a seven or ten footer. You can pick any of the rods, take an eight footer for example, and cast it, then pick out twelve more and they will feel just the same. You can’t say that about all makers. I think Leonard was particularly noted for being inconsistent, and that’s not a criticism, but it does mean you can’t say that every Model 50DF will feel just the same. TEAL: I always look for the inception spark on why people take on Labors of Love. Clearly, your book on Granger is a work of love. Why Granger instead of, say, Heddon? MS: Well, it’s a story of how I got involved in bamboo rods in the middle 1980s, I had my grandfather’s fishing hat, vest, and creel on an old hat rack in the corner of my living room. I started thinking, “wouldn’t it be great if I could find one of those old bamboo fishing rods to lean up there with that?” We were living in Denver at the time, so I went out to the old Mile High Flea Market, and started looking around for bamboo fishing rods. For weeks I didn’t see a thing. Than one day, I came across a fellow who had three rods. One was a South Bend, which I knew because it had the sticker on it. I don’t recall the second, but the third one didn’t have a name on it, but it looked old. There was something about the way it was built that just appealed to me. The guy wanted $25 for it and I thought that was an awful lot of money for an old fishing pole. But I bought it anyway, and took it home, leaned it up and it looked good. One day I picked it up and started to fiddle with it, and began really paying attention to it, and it hit me: this is really interesting! That’s where the illness started. I thought, gee I wonder when this was made…and things got ugly from there. I bundled it up, and took it to the fly shops in Denver, one of the fly shops didn’t know what it was but they did sell me a bag for carrying around this nine-foot two piece. Then I happened to run into [rodmaker] Steve Jenkins. He got to looking at it, and said, gosh this one is old. I can see here it used to have intermediate wraps. I asked him what it should look like, and he said he didn’t know, because he wasn’t sure who made it. I asked him how much he would charge me to make it look right. He said “we charge $300 and one dollar for every intermediate.” And I started counting intermediates, and discovered the price of happiness just went up. I asked him if he knew anyone who could help, and he gave me Len Codella’s address. So I did a drawing of the rod and sent it to Len, and he wrote back and said, “nice drawing. Your rod was made by Fred Divine about 1925.” I thought to myself, “GREAT! All I need to do is find out about Fred Divine.” There was NOTHING there. Finally I came across Marty Keane’s book, and it was a done deal by that time. I started reading about Divine, and Marty talked about how they liked bright colors, and in the process of reading the book I saw the references to Denver and Granger. I thought, “Hey, I live here!” and immediately started getting a warm fuzzy feeling. And I wanted to find one of those rods, thinking it would be so cool. So that’s how I got hooked on Granger. As an aside, Marty Keane started talking about the rods with red intermediates, and they really turned me on. I’ve since come to the conclusion that red intermediates and red wraps with black tipping is as classy as it gets. TEAL: I notice that’s the color scheme you use on your New Divine Rods. MS: That’s because that’s the color scheme they used on the old Divine rods! People say it’s a beautiful rod, and I always tell them, “I’ll pass on the compliment to Fred when I see him.” Because I didn’t dream it up, that’s the way they were. TEAL: Back to Granger. So Granger became an early passion of yours? Like I said in the Granger book, my very first love was the Granger rods and I went off on tangents because I found them interesting, but I never gave up on the Granger story. TEAL: I find that the best historians are the most stubborn—they don’t give up even when everyone else in their right mind would have thrown in the towel. MS: Yes. A lot of people tell me they want to write a book. Actually, what they are telling me is they want to have WRITTEN a book. Because they don’t have a clue how it absolutely takes over your life. You wake up in the morning and wonder what Fred Divine had for breakfast. Others might think this is stupid and ask why. I don’t know. Because I want to know more! TEAL: How has technology changed the way you do your research? TEAL: Let’s change course for a minute. I understand you recently built your first cane rod from scratch? MS: That was about two years ago now. My friends Bob (Nunley) and Harry (Boyd) were about to start up their Ozark Rodmaker’s School and they were looking for a few Guinea Pigs. They said that if I bought the materials, they’d run the class. So me and Sharon [Michael’s wife], who had always wanted to build a rod, took their first class. It was a blast. What I really learned more than anything is that there are more than a million ways to screw up a rod. I knew the general procedure and everything, so there weren’t a lot of surprises, but there were some interesting tips I picked up that helped me in my restoration work. But building a rod up from bamboo culm to fishing rod is a lot of work! And although none of the work is really hard, it is exceptionally repetitive, especially the planing. I can understand why so many people use the rough bevellers to get down to the sixty degree strips. The level of detail involved is phenomenal. I’m a guy who is only comfortable using hammers and vice grips. I can usually manage a screw driver. So get me in there with something with tolerances of thousands of an inch, and it was frightening. TEAL: How did this experience help you better appreciate Granger? MS: It definitely made me appreciate their consistency even more. As far as consistency, it was their machinery as much as anything that was responsible for it. I may have shorted that section in the book, actually. I didn’t emphasize enough how incredibly important Mr. Holding’s machinery was. He became completely enamored with the thought of using a natural material, and machining it to such precise measurements. He was one of those fellows who was used to designing machinery for metal work. I think he might have been an angler at the beginning (he was at the end), and his machinery was designed in such a way that it was exceptionally heavy. He was English, and came from those people who are belt-and-suspenders kinds of guys – look at a Hardy or a Dingley reel. It’s built like a tank! You could probably break one with a hammer, but short of that, no way. He built his machinery the same way. Several different people told me that either Mr. Holding or Mr. Phillipson would set up the beveller, and they did all the precise settings, and that they had a method of locking it down so that even if someone accidentally bumped the machine, it did not shift the adjustment. Therefore, they would take rough bevel strips and run them through the machine one after the other. This is how they made such precise strips. Holding also designed the glue bath machine, which was a glue bath and rough winder all in one. No one ever mentioned what kind of glue they used, but everyone said it absolutely stunk. That doesn’t sound like an animal glue… The glue was heated, and they would immerse the strips loosely wrapped into the glue, then put them through the big wheel that put the final tension on them. Since the glue was heated, it helped somewhat with the durability of Granger rods. You rarely see a delaminated Granger, and when you do, it’s usually covered in black because it was stored wet. Mr. Holding was so careful in the design of his machines, and this is surely one of the reasons for the amazing consistency of Granger rods. Mr. Granger personally insisted on these things being done exactly the right way. He seemed to have always been in the shop. He didn’t go out and sell, about all he did was participate in tournaments. This is why he could write, as he did in one of the catalogs, printed in bold print, “It is my job to inspect every rod.” I think Mr. Granger meant that. I don’t think it was advertising hype. TEAL: That is fascinating stuff. In closing, what is your favorite Granger? MS: I personally favor the sliding band models, because of their slower action. It’s not enough to mention, but it is there. It flexes a little further down into the mid, and I just personally like that better. TEAL: Finally, what explains Granger’s enduring success? MS: The Granger pride of workmanship was one of the major keys to their success. Many thanks to Michael for taking the time to talk to me, and to talk Granger, Heddon and Divine! A vintage bamboo fly rod could attract a steep price especially when tested heavily by time and experience. A personally made bamboo fly rod assures the user that there were no shortcuts in the way this rod was made and that there is no short changing of the finest materials used to create such. The result is no less than the finest hand crafted bamboo fly rod that is surely meant to become vintage as the years go by. Hi! I enjoyed the interview. I was hoping someone might be able to help me with dating a rod. I have two old Grangers that have been in the family. One is a Wright & McGill Special with lettering toward the handle, so that is not too tough, but the other is a plain Granger 8' three-piece Victory with a sliding ring seat. It has the cross-hatching on the seat below the handle. I'm guessing this is a 1920s or so rod? Anyone able to help? Trying to justify buying the Granger book to myself. Looks great! Fishing For History Turns 4! UNID Files #11: The Jim Harvey Imposter? UNID Files #02 UPDATE: The Case of the Paper Minnow SOLVED! My name is Dr. Todd Larson, and I am a college history professor who writes on the history of fishing in America. I started this blog to help people better understand their outdoor heritage. I am originally from Duluth, Minnesota and live in Southwestern Ohio with my wife, daughter, three fish, two cats, and a dog.